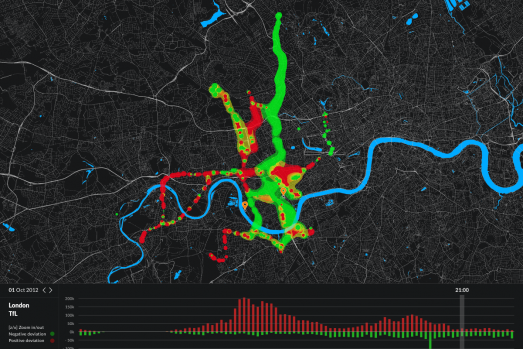 The goal of this research is understanding urban mobility through the visualization of the use of public transport systems. We focus on the visualization of anomalies regarding the number of passengers. 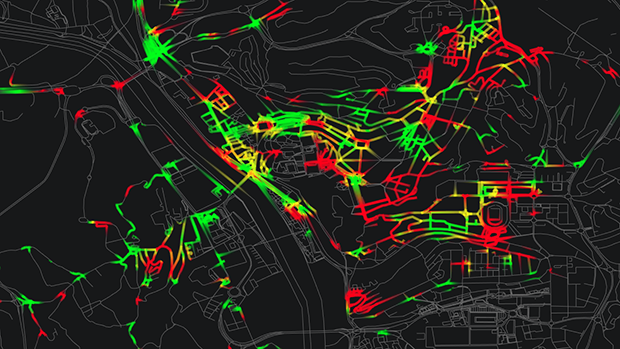 To find patterns of use we analyze the raw data, which contains people counts for every bus stop in Coimbra city with half hour interval. For each stop, and for each day of the week, we calculate the average number of passengers and its standard deviation in each 30 minute interval. This allows us to identify situations that deviate from the norm. To produce the visual artifacts we rely on the Metaballs technique. In order to augment performance all the data is pushed to video card and the visual output calculated using fragment and vertex shaders written in GLSL. 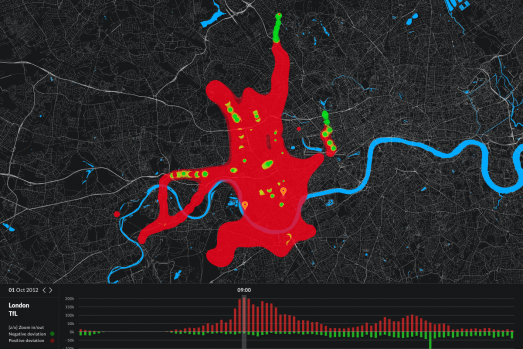 Our representation of urban dynamics is embodied by two visualization models. The first represents the deviations and the city map on separate layers; The second embeds the deviations into the vectors of the city map. These complex and computationally heavy representations have the goal of simplifying the identification of patterns in large quantities of data. To further promote visibility, we resort to exaggeration, which allows the visualization of small details, even in the global view, which would be invisible by direct mapping. Thus, the goal is to convey the truth using visual distortion. 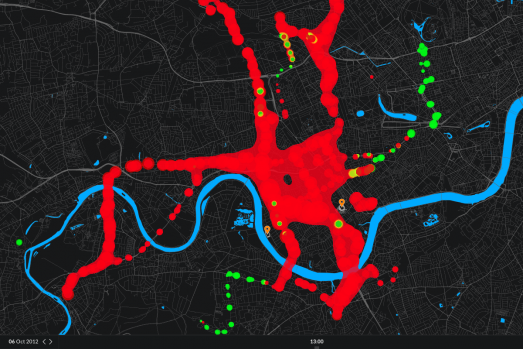 Visualizations of the urban mobility created by applying the Metaball technique to colorize the pixels with general view, image on the left, and zoomed view, image on the right. Displayed the data for 13 of April 2012 at 14:00h. We generate an isosurface where the position of each charge point is the GPS position transformed to the screen coordinates, and the force is the absolute value of the deviation. A positive deviation, i.e. an abnormally high number of passengers, is represented in red, while a negative deviation is represented in green. Forces superior to 1 are represented with an alpha component of 0.5, forces superior to 0.5 are represented with an alpha component of 0.3. The justification for the use of a two-band threshold, can be understood by analyzing the global view of the city and the zoomed area. As it can be observed, the forces superior to 1 tend to result in circles since the influence of other charge points tends to be negligible by comparison. This contrasts with the areas of transparent green and red generated by forces in the [0.5,1] interval, which assume a more organic nature filling in the gaps among strong forces and highlighting areas where anomalies are occurring. When we zoom in, the exaggerations caused by the representation of these small forces are reduced and the visualization becomes more rigorous. The second approach is based on the same technique. The difference is that the output of the function is applied directly to the shape vertices of the map. First, the road map is retrieved from OpenStreeMap, unnecessary objects are filtered, and all lines are parsed into shapes. Then, the Metaball technique is applied to determine the color for each vertex of the map. Although, this approach is less computationally expensive, in our opinion, the visual output is not as clear and informative. The outcome of this process is an interactive visualization application with two models of visualization, one presents a clear and informative, albeit exaggerated, view of the anomalies, while the other sacrifices visibility for the sake of rigor. So, while validating our model with TfL data we noticed that the amount of exaggeration was too high. In order to change the exaggeration we added one variable that controls the slope of the equation. As we increase the slope the resulted blobs tend to the shape of circle with radius equal to the target radius. 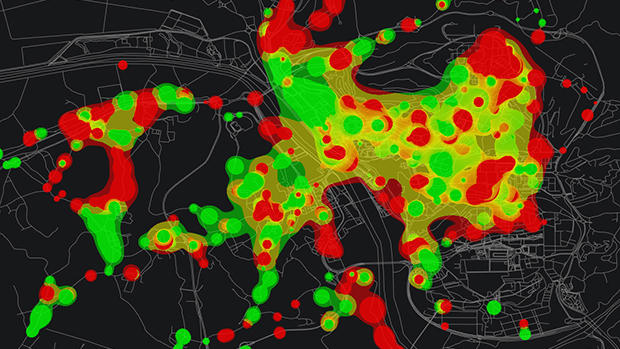 While the low values for the slope makes the blobs to be more expanded/exaggerated. The presented visualization model was embedded in an exploratory application along with a bar graph that represents the variation of network’s load through the time. The application allows the user to navigate in time, as well as zoom and pan the visualization. The model transforms according to zoom level and morphs from state to state regarding to the selected date and time. Visualisation application of TfL data — standard deviations from normal, with controlled slope of metaball function. Image on the left shows a network load at 9.00h and image on the right shows the deviations at 21.00h. Eight bus routes were represented. E. Polisciuc, A. O. Alves, C. Bento, and P. Machado, “Visualizing urban mobility,” in Special Interest Group on Computer Graphics and Interactive Techniques Conference, SIGGRAPH ’13, Anaheim, CA, USA, July 21-25, 2013, Poster Proceedings, 2013, p. 115.